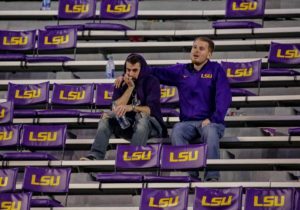 LSU wrap-up: Bama dominates in every way in thrashing of Tigers | TideFans.com | By the Fans, For the Fans. The fact Alabama beat LSU was no surprise. The fact Tua Tagovailoa had another vintage Tua game, also no surprise. Alabama’s defense choking out the LSU? Surprising enough maybe to raise a single eyebrow. Slightly. All of it at once? Surprising given the way the season has played out so far. Alabama came into this game with no question marks on offense. It displayed no question marks on defense in this game, either. As long as kickers aren’t involved, this looks like a team without a weakness. And despite the fact many games turn on special teams, when the offense is this explosive and the defense this dominating, special teams rarely get the chance to make a critical impact. For all the yammering from LSU’s side early in the week about Devin White, White wasn’t a factor. Tiger Stadium, not a factor. Ed Orgeron’s accent, not a factor. The factors in the game were Tua Tagovailoa, the Alabama defense (especially Quinnen Williams) and the same supporting cast members that have been factors in eight other games this year. The term “team win” is overused in sports analysis but that’s exactly what happened here. As such, the 2018 season is dangerously close to becoming a two-team race (Alabama, Clemson) with the other 120-odd teams looking on from the sidelines. A quick perusal of any other game on television will tell you what you need to know about football played by any other program. The talent (and skills) gap Alabama and Clemson have built over the rest of the football world is stupefying. Part of the shock over how Alabama manhandled LSU was certainly media-driven, aided by an off-week where everyone not a fan of the Alabama program was given a week to look around and try to invent ways LSU could make this game a close one. Somewhere along the line, the decision was made to overlook the issues LSU is having along both lines of scrimmage, to say nothing of a quarterback who is limited at best. Louisiana may be known for its dynamic music, culture and especially its food, but in regards to the latter, Joe Burrow is about as dynamic as meringue. As such, LSU couldn’t generate offense. It had no hope of keeping up with Tagovailoa, even after its fans were able to cause some communication issues within Alabama’s offensive line in the first quarter, which led to a punt on the Tide’s first drive. By the half, though, it was all a familiar refrain: Alabama had everything it needed at that point to win the game. So it’s little surprise that White joining the game in the second half had all the impact of a helium balloon crash-landing at a pillow factory. Alabama scored almost as many points on White’s defense as they did on that of his backup, Patrick Queen. By the time arguably the best kicker in college football missed a chip shot that would have broken up the shutout, Alabama was already printing up its “SEC West Champions” promotional material and putting together the gameplan for Mississippi State. It’s hard not to be enthralled with Ed Orgeron and his love for the LSU program, his energy and his intensity. But LSU fans are going to ask about the decisions Orgeron made to punt inside Alabama territory down multiple scores, and to even attempt the field goal at the end. In its games against LSU while Orgeron has been at the helm, Alabama has never exactly gotten a tactical challenge from the LSU sideline. For now, Alabama has to bounce back to prepare for a Mississippi State team that will bring the best defensive line Alabama has faced all year. And like 2017, Alabama is banged up coming in, with several playmakers nursing a variety of injuries. 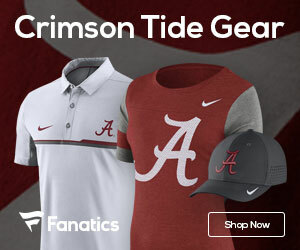 But Alabama gets the benefit of the 24-hour rule tonight (or, should we say the 25-hour rule thanks to Daylight Saving Time’s end), and can celebrate knowing that it’s back to Atlanta at season’s end for yet another matchup with Georgia. Tua needed to have a full-game performance for Alabama to win. He delivered. It’s not really a surprise that Tagovailoa had to play into the fourth quarter for the first time this year, but it’s equally not a surprise he put up numbers commensurate with his hype. Tagovailoa went 25-of-42 (59.5%) for 295 yards, 2 touchdowns and 1 interception, and ran for another score. Even Tua’s interception didn’t hurt Alabama, and probably helped Alabama in the long run because it was the equivalent of a punt that trapped LSU inside its own 5. Firing against the best secondary he’ll see this year, Tagovailoa’s accuracy was hardly affected.LSU did a good job of limiting deep-field bust plays even while playing man coverage. On Tagovailoa’s interception, had a rusher not gotten through the Alabama offensive line quickly and forced Tagovailoa to roll left, he probably would have hit Jerry Jeudy down the right sideline for a score. But it didn’t happen, and that’s to LSU’s credit especially given safety John Battle was injured on the opening drive of the game. In the end, though, Tua simply got so many opportunities, LSU couldn’t hold him at bay forever. Quinnen Williams’ emergence has allowed Alabama’s defense to go to the next level. 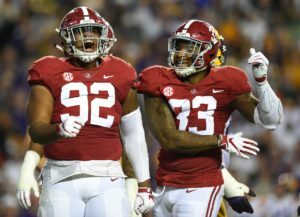 When Da’Ron Payne opted to head to the NFL Draft a year early, no one predicted Quinnen Williams would actually outshine the man some think might have been the best nosetackle in Alabama history. Instead, Williams is playing the position at a level few before him have ever approached. Williams’ first step off the snap is already legendary, and he fought through multiple double teams Saturday to make Joe Burrow’s night a stressful one.As an aside, Williams (and the rest of the Alabama DL) also had to fight through some of the worst officiating from the umpire position we’ve seen in the SEC this year. There were no holding flags thrown on either team; several calls were not just missed, but missed egregiously. We’ve said before this does a disservice to SEC players who get matched up in bowl games playing in front of neutral officials, and those officials opt to actually go by the rule book. At any rate, let’s focus on Williams: He was Alabama’s leading tackler with 10 stops, got 3.5 tackles for loss and 2.5 sacks. Alabama held LSU to 12 yards rushing, and Williams was the key to that. More special teams woes, but Mike Bernier gave Bama what it needed at punter. Let’s talk about the good first: Mike Bernier didn’t have a great average per punt (32.8 yards per kick), but LSU was not able to return any of them, and he put 2 of his 4 kicks inside LSU’s 20. We said it last week, but if Bernier can be the second coming of Jeremy Schatz, Alabama will be just fine. As for the placekicking situation, Joseph Bulovas ought to come to practice with a bullwhip Monday and start swinging it. Mac Jones flat-out dropped the snap on Bulovas’ first PAT attempt, and his third PAT attempt was blocked as the result of what looked like a protection breakdown. Alabama’s got to fix this. Linebacker play was at its best all year and was the reason Burrow never got comfortable. Outside backers Anfernee Jennings and Christian Miller looked like they’d stolen LSU’s playbook, so adept were they at diagnosing plays. Their relentlessness at crashing the pocket from the outside meant Burrow was often forced to work with just half a field, scrambling away for his life. Inside linebackers Dylan Moses and Mack Wilson dominated in the running game, and Wilson played his best coverage of the season, punctuating it with an interception in LSU’s end zone to preserve the shutout. Alabama’s linebackers had similarly dominated against Tennessee, but doing it for yet another week, against the best team Alabama has played yet, marks a trend, one Bama fans certainly welcome. Injuries are starting to pile up, and Mississippi State is capable of capitalizing. The list of Alabama players with leg injuries is staggering: Terrell Lewis, Chris Allen, Henry Ruggs III, DeVonta Smith, Tua Tagovailoa, Jalen Hurts, Najee Harris, Trevon Diggs. MSU has been a dangerous opponent for Alabama in recent years because Alabama is always coming off a physical test against LSU and really could use a recovery week rather than having to get back up to play another hard-pounding team. The injuries to the offensive skill positions are most worrisome at the moment. DeVonta Smith was going to sit the LSU game out but was forced into action when Ruggs went down, and clearly was not 100 percent. Ruggs has a contusion and is expected to play next week, but it would be a surprise if either he or Smith were back to normal.Najee Harris’ ankle injury looked uglier than it was, but it will probably still be enough to affect his carry load against the Bulldogs. That’s unfortunate given how effective he had gotten in recent weeks. Tagovailoa is the football equivalent of a 1963 Jaguar XKE: Flawless style, performance, power, speed, the ability to cut on a dime – but his knee ligaments are apparently like Jaguar’s infamous Lucas electrical systems, prone to breakdowns and making every trip unnecessarily stressful to endure. Look for next week’s game to be closer than this one was.Follow Jess Nicholas on Twitter at @TideFansJessN.